EDEN is a gourmet tour through Vietnam: from the mild spicy aromas of the north over the savory sophistication of the middle to the lovely sweetness of the south. Our Restaurant stands for a charming “Garden of EDEN” and its harmony with lamps of light bamboo wood hanging from liana-like ropes illuminating plant worlds and green bamboo sticks like in a tropical garden. EDEN’s breadth of dishes enchants every gourmand and allows immersing with all senses in Southeast Asian spheres. We use only healthy and fresh ingredients of highest quality. Hereby we achieve a harmonious interplay of contrasting colors, multi-faceted spices and floral aromas. Whether a relaxed after-work drink among colleagues, casual lunches with business partners or a romantic dinner in the circle of loved ones – EDEN is a culinary paradise for every occasion and at any time. The cuisine of the central region has been in the traditions of the royal seat and with Thai influences of flowers, coconut milk and fish. In king’s- and princely courtyards the limited supply of goods – rice, mung beans and noodles – was ennobled by imagination and refinement. Here is the home of classic soup kitchens and fish dishes. It is spiced with fresh herbs and mild flavors. Almost a 1000year period of Chinese dominance has enriched the North Vietnamese cuisine with sophisticated new techniques of preparation such as wok steam cooking in bamboo bowls. Black cardamom, fermented soybeans and star anise are constituent of Vietnamese variety. This part of the country is influenced by Indian spices and fruity ingredients. The sweet and hot of India has wonderfully been combined with the variety of South Vietnamese flavors. In addition the South has benefited from the influences of French cuisine and is regarded as a gourmet’s paradise. Hands down one of the best sushis I've ever had. Beautiful arrangement of the food, friendly staff and reasonable prices. Will definitely be coming back! Magic noodles promise magic power. Inspired by the new trend from Ho Chi Minh City we also create “flying noodles” in our EDEN Restaurant. 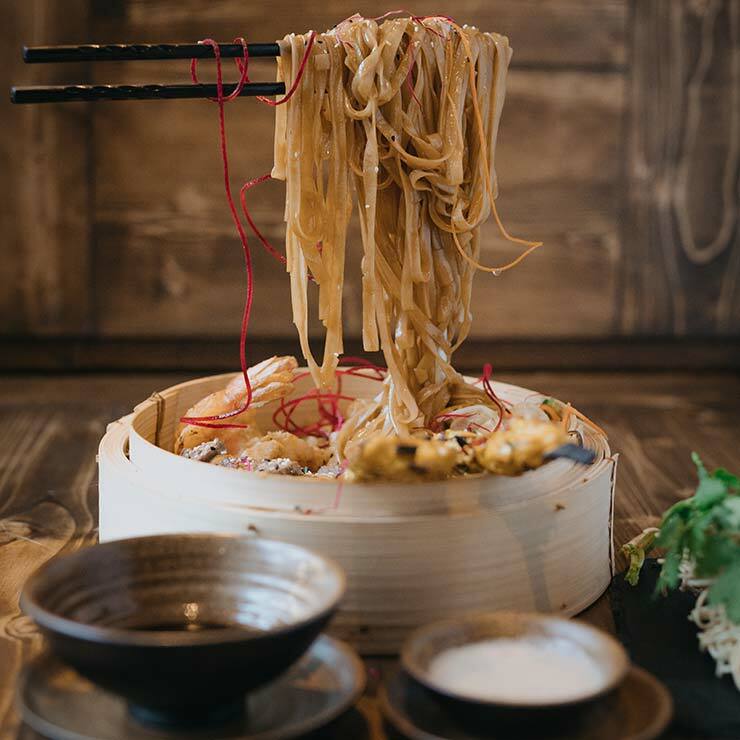 Noodles are hovering over the plate as if hold by a ghost’s hand … while on the plate below grilled chicken, beef and prawns in a sesame marinade are meeting. Our special EDEN Sauce and vegetables welcome the flying noodles when landing.